Over the last few years, the small SUV crossover category has quite literally exploded, to rank amidst these popular competitors you’d need to tick all the boxes. 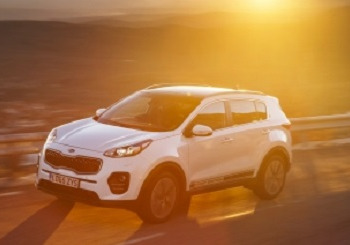 The new Kia Sportage has taken a revolutionary design that re-branded Kia as a less of a ‘budget’ label and have given themselves the challenge of bringing it even more into the position of a class-leader. Where there may be some elements that are not quite as high tech as competitors, it really proves itself through all its detailed improvements, making itself just that bit better than previous models to gain the title of an even better all-rounder. It stands out from the crossover crowd, with its sharp design and sloping roofline it really does live up to its Sportage name, but they have made some changes. There is the introduction of the new ‘tigers nose’ grille, with former Audi designer Peter Schreyer on board with this one, it is no surprise that it stands out in its segment whilst still maintaining the key identifiers of its predecessor. The driving experience is already a stand out feature. It has developed and grown from previous models and is quieter and softer. Thanks to a new electric steering system and stiffer chassis the Sportage has been made for an easier, more fun and better drive experience. Under the bonnet you will find the same engines as the previous Sportage, a 1.6 Petrol and 1.7 or a 2-litre diesel but wait, there is also a brand new 174bhp 1.6 Turbo petrol - but that only comes with the sportier GT line. All the engines have been slightly modified to make them more efficient and overall better runners. For example, the 1.7-litre diesel has cut its fuel consumption by 7mpg and its CO2 emissions are down by 16g/km and the 2.0-litre diesel has lowered its emissions by 29g/km. Overall the performance and the output of the engines is better, more efficient and, of course, better for the environment. The interior of the new Sportage is really fresh, with its flat faced dash design bringing the sporty essence of the vehicle through and the stitch effect gives it really classy and top-end feel. The overall feel is more mature, and details of the fit and finish are just better! Soft-touch plastics, bigger buttons and more comfortable chairs are just some of the more noticeable changes. There are two sets of Isofix points in the rear passenger seats, what with the wider rear door access and higher ride height it is a forerunner as a family car where practicality of loading smaller members of the family is needed. There are some hard plastics in the vehicle but it is all really well put together. The smaller details of this crossover are just better, and it really goes a long way to improving the feel of the interior, making it a really comfortable and pleasant environment. The ergonomics have definitely been a focus during development, the fully adjustable driver seat, the adjustable steering, the dash layout and the infotainment system have all been designed with ease of access, safety and a great driving experience in mind. The new car has grown by 16mm over the old one and this is very apparent in the rear passenger seats, great and comfortable legroom with more than enough space to fit 3 adults, including in the middle seat thanks to a low transmission tunnel overall the family SUV provides huge amounts of legroom and lots of head room. The boot is also a top contender in its category, again it is better that previous with a lower boot lip, loading area square and the load space is nice and flat. There are also a load of great nifty storage areas, under the floor of the boot and the removable parcel shelf is a really innovative element that allows you to use the space in even more diverse ways. The boot is 503 litres and 1492 litres at full capacity. The storage in the car is good to, big door bins, front central cup holders, a great sized glovebox compartment and the middle armrest in the rear pulls down to reveal two cupholders. While all-wheel-drive versions get a new Advanced Traction Cornering Control system. Great tech that provides higher safety all added to the foundations of safety that it already had! Technology has become a fundamental aspect across the automotive industry. Tech and equipment is pivotal in the sales of new cars, Kia has always offered a great level of equipment across their cars. The Sportage has never been an exception but they really have given you more this time. All cars get air-con, USB ports, DAB digital radio and even cruise control, which is pretty good where standard features are concerned. Above this, you’ll start to find some very special features. The mid-spec vehicles come with a 7-inch touchscreen with integrated connectivity, cameras and sat-nav. Overall the equipment available to your standard spend is pretty phenomenal and has not isolated the lower budget buyers with below average spec. This all means it really is better than ever. Nicer to drive, better made and roomier. Though there are some very divisive design elements, mostly in the redesigned face of the Crossover, it still has a really smooth and elegant look about it. They’ve fine-tuned small details, and, by doing so throughout the vehicle, have made a huge difference in the overall perception of the car. It has a great high quality finish both in and out and this has all been done by simply ‘bettering’ key qualities of the vehicle. And although many aspects have been tweaked their 7 years or 100,000-mile warranty is still very much the same and intact! Ecologically aware, stylish and a great performer, what more could you want?